A milonga organizer in the First World can structure the environment of a milonga to create an atmosphere that more closely resembles that of Buenos Aires milongas. Aspects of First World milongas that need to be brought under control are collision hazards, exhibition moves, and teaching on the dance floor. A characteristic of milongas that needs to be encouraged is use of the cabeceo for dance invitation. The greatest and most direct impact an organizer can have on a milonga is in the selection of a DJ who plays only classic tango music for dancing tango, which will have some effect in reducing exhibitionism and navigational hazards (compared to playing nuevo tango and non-tango music for dancing). Additional impact can be achieved by managing the layout of seating and lighting to create a clear view of potential partners and thus promote use of the cabeceo. The layout of tables and chairs also can be structured to increase floor density, which should discourage exhibitionism. The milonga organizer can also affect milonga behavior by omitting certain features common to First World milongas. Omitting exhibitions during breaks from social dancing removes a stimulus for exhibitionism on the dance floor. Omitting pre-milonga lessons eliminates a stimulus for teaching on the dance floor. The most difficult role a milonga organizer has in creating an environment that promotes Argentine tango cultural traditions is how to deal with dancers who continue to ignore milonga codes despite these structural changes; ejection from the milonga is an option to be considered. The milonga is the social environment in which tango dancing occurs. In Buenos Aires the character of milongas has been shaped by practical needs, and by cultural influences from Argentine society. Within the milonga environment a unique subculture has evolved, with codes of behavior and common practices that allow the milonga to function effectively to promote dancing and socializing. These customs deal with behaviors such as inviting someone to dance and movement on the dance floor, as well as interactions with one’s partner, other couples on the dance floor, and the people who are not dancing at any point in time; there are also customs regarding the environment, such as the music played for dancing, the arrangement of tables and seating, and the amount of lighting provided (Codes and Customs of the Milongas of Buenos Aires: The Basics) [Do Milongas Exist Outside Argentina? (The Milonga Codes Revisited)]. Within Buenos Aires tango culture, dancers learn these customs in order to function effectively in this social environment, i.e., find partners with whom they can dance and have an enjoyable social and dancing experience. A milonga organizer in the First World may wish to incorporate the characteristics of Buenos Aires milongas in the milonga he or she is hosting. Promoting Argentine tango cultural traditions in a foreign cultural environment has its challenges [Factors Affecting the Survival of Argentine Tango Cultural Traditions in Non-supportive First World Cultural Environments (The Dominance of Tango Extranjero)]. Cultural influences from the local community are different from those in Buenos Aires and may act in opposition to implementing this goal. In particular, there are differences in musical preferences [The Alternative Milonga (Neolonga): The Social Environment for Dancing to Tango Alternative Music], perception of personal space (Variations in the Tango Embrace – ‘Open Embrace’ and ‘Close Embrace’ Styles of Tango: The Evidence from Buenos Aires Milongas), customs of seating arrangements and dance invitation (Use of the Cabeceo and Gender Segregated Seating in Milongas in Buenos Aires and Elsewhere in the World), as well as attitudes towards exhibitionism and teaching on the social dance floor (Preventing Teaching on the Milonga Dance Floor: The Role of the Pre-Milonga Lesson). Nevertheless, the milonga organizer has a certain degree of control in shaping the milonga environment in such a way as to create conditions that promote the adoption of Argentine tango cultural traditions, as well as inhibit the performance of behaviors that are antithetical to these traditions. This is the focus of the discussion below. Provide the appropriate musical environment for dancing tango, i.e., where the DJ plays only classic tango music from the Golden Age, or music from contemporary orchestras playing in the style of the tango dance orchestras from the Golden Age (Music Played at Milongas / Tango Social Dance Venues). Encourage the use of the cabeceo for dance invitation as a replacement for direct approach to the table. Encourage the formation of a circulating ronda (i.e., good navigation). Discourage exhibitionism on the dance floor. Discourage teaching on the dance floor. If a milonga organizer can create an environment that accomplishes these goals, this will distinguish that milonga from most milongas that occur within First World cultural environments. The milonga organizer should avoid selecting a location that is open to the non-dancing public. It is commonly believed that hosting a milonga in a public place such as a restaurant, bar, coffee house or public park may attract attention to tango and assist in the recruitment of new dancers. This may be true. However, if this exposure encourages participation in tango dancing by those who lack the skills necessary for dancing at a milonga, this will hinder the formation of a smoothly circulating ronda. The presence of inexperienced dancers at a milonga also encourages teaching on the dance floor (often by the inexperienced dancers themselves). Hosting a milonga in a public environment encourages exhibitionism and attracts dancers who dance tango for the purpose of exhibition. In particular, hosting a milonga in an environment where consumption of alcohol is the primary motivation for attendance (i.e., a bar) enhances the probability of exhibitionism and reckless navigation in general. Consumption of large amounts of alcohol also has a negative impact upon balance, which can create navigational hazards. A suitable location for a milonga is a social club or community center that is rented for the occasion of the milonga. In this type of environment almost all milonga attendees are tango dancers and there is no distraction from spectators. This is how many milongas are hosted in Buenos Aires [e.g., Milonga de los Consegrados in El Centro Region Leonesa, La Milonga del Mundo in the Sunderland Club, a sports club in Villa Urquiza, Nuevo Chique in Casa Galicia]. The milonga organizer can have a significant impact on the character of a milonga by choosing and modifying the physical environment. Milonga organizers may be limited in the degree to which they can modify the physical characteristics of a milonga environment, due to restrictions placed by the owner of the space. The greatest flexibility in creating a milonga environment occurs when the milonga organizer has exclusive use of the space during the time period of the milonga and either can set up the tables and chairs and control lighting and sound or make a request to the renter for a specific setup. An important characteristic to consider in choosing or modifying a milonga environment is the size and shape of the dance floor. Some would consider a large dance floor desirable because it can accommodate a large number of dancers. However, a large floor with a lot of empty space provides room for exhibitionism and teaching on the dance floor (Preventing Teaching on the Milonga Dance Floor: The Role of the Pre-Milonga Lesson). A small dance floor may create conditions for collisions caused by dancers who lack sufficient navigational skills, as well as by women for whom elevated kicking is an integral part of their tango dancing. Creating the ideal dance floor size is an imperfect art in that attendance is somewhat unpredictable; however, over time a milonga organizer may be able to anticipate attendance reasonably well. Flexibility in the size of the dance floor may be an option available to organizers if they are able to move tables to modify the size of the dance floor (in setting up for a milonga, of course, not during a milonga). The milonga dance floor should be rectangular in shape (which includes a square shape). To be avoided are L-shaped, triangular, hexagonal, or circular dance floors that have poor definition of corners and thus invite a variety of interpretations for floorcraft, many of which create navigational hazards. With respect to choosing between a square shape (such as exists at El Beso and Lo de Celia) or an oblong rectangular shape (i.e., with 2 long sides, as exists at Centro Region Leonesa and Club Gricel), the size of the floor overall determines its suitability for promoting Argentine tango cultural traditions. Considering two floors with the same area (e.g., 80’ x 20’ oblong rectangle vs. 40’ x 40’ square), the oblong rectangular floor provides a longer linear perimeter (and space for a longer circulating ronda) and less space in the middle of the floor for exhibitionism and teaching. However, for large oblong rectangular floors, the sightline for execution of the cabeceo is compromised, as occurs at Club Gricel, where tables for men and tables for women are interspersed instead of having the more traditional configuration of clearly defined separate sections of tables (i.e., an uninterrupted row or rows) for men and women. Overall, having a milonga dance with a small area will allow the most effective use of the cabeceo for dance invitation as well as limit space for exhibitionism and teaching on the dance floor. Within First World cultures, a hardwood plank floor provides a most attractive and comfortable surface for dancing. Numerous milongas in Buenos Aires (e.g., Centro Region Leonesa, El Beso, Club Gricel, Nuevo Chique have hardwood plank flooring. However, several popular milongas in Buenos Aires instead have stone tile flooring (e.g., Lo de Celia, Salon el Pial, Sin Rumbo, El Arranque, Confiteria Ideal). Thus, although the more comfortable hardwood is preferred, a stone tile floor can function well in that it does not interfere with the promotion of Argentine tango traditions at a milonga. A smooth surface for dancing is required, but choice of floor material is not as important as some other factors discussed here in the selection of a location for a milonga. Placement of the tables around the dance floor can have a significant impact on the character of a milonga. First of all, the tables should be placed to create the desired rectangular dance floor, in order to enhance the formation of a circulating ronda. Thus, tables adjacent to the dance floor should be rectangular (square is preferred, as explained below), and circular tables should be avoided in general because they poorly define the edge of the dance floor. No chairs should be placed on the side of the table that is part of the dance floor; i.e., the edge of the table defines the dance floor, because movement here creates navigational hazards. Likewise, for tables not adjacent to the dance floor, no chair should be placed so that someone sits with his or her back to the dance floor, because the focus of one’s sight in a milonga is on the dance floor. If there is room for only one row of tables for seating in any part of the hall, an aisle should be created on the side of the tables away from the dance floor; this allows people moving around the milonga to avoid moving onto the dance floor in their transit, thus reducing the probability of collisions and enhancing navigation. Placing an aisle behind a single row of tables also decreases the size of the dance floor, thereby decreasing the space available for exhibitionism and teaching on the dance floor. A decision may need to be made as to whether the milonga is to resemble more closely a Milonga del Centro, in which the cabeceo is used for dance invitation versus a Milonga del Barrio, which consists primarily of couples who do not exchange partners [Tango de Salon: The Tango of the Milonga (Part II of ‘Tango Styles, Genres and Individual Expression’)]. This will affect the type of tables used and their orientation. In Buenos Aires, at a Milonga del Centro, the custom is to use small square tables, with chairs placed on 3 sides, all facing the dance floor. (e.g. Lo de Celia, Centro Region Leonesa) This arrangement maximizes the number of dancers who, without significant turning of their heads, have a clear view of the tables where potential dance partners are seated. In contrast, at a Milonga del Barrio, which partner exchange is uncommon and groups of friends socialize at their tables, oblong rectangular tables tend to be used (Sunderland Club, Glorias Argentinas); this maximizes social interaction among friends sharing a table. These rectangular tables are placed with the short side facing the dance floor, because direct view of the dance floor in order to use the cabeceo for dance invitation is not necessary; under these conditions this placement of tables maximizes the number of chairs that can be accommodated. It can be assumed that for most First World milongas, a significant number of dancers come to a milonga with the intent of dancing with more than one partner. Most likely, only a small fraction of dancers will use the cabeceo for dance invitation and, in general, gender segregated seating will meet with resistance, even though these Argentine tango cultural practices provide optimal partner selection (Use of the Cabeceo and Gender Segregated Seating in Milongas in Buenos Aires and Elsewhere in the World). Creative solutions are needed to increase the use of the cabeceo and decrease direct approach to the table as the method of dance invitation. This may be accomplished by imparting special status for those using the cabeceo, by reserving the best seats adjacent to the dance floor (with placards stating ‘reserved for men’ and ‘reserved for women’, perhaps even stating ‘cabeceo section’) for those agreeing to use the cabeceo for dance invitation. This will require a host inquiring upon entrance whether one intends to use the cabeceo for dance invitation and those agreeing will be escorted to the appropriate section. The prime location of the users of the cabeceo will make them visible to other dancers and provide an example of Buenos Aires milonga customs. The success of this arrangement depends upon having a sufficient number of dancers who are knowledgeable and skilled regarding the use of the cabeceo and abide by the commitment to use it when seated in the Cabeceo Section. Unless the milonga organizer is also a tango instructor, this is beyond the control of the milonga organizer. The tables for the men’s and women’s sections need to be positioned so that there is a clear line of sight between them. In Buenos Aires, when the floor is rectangular, the men’s and women’s sections are usually placed directly across from each other along the long side of the rectangular (e.g., Centro Region Leonesa, Casa Galicia), with some wrapping around to the short side, whereas when the floor is square, men’s and women’s sections are likely to be placed perpendicular to one another (e.g., El Beso and Lo de Celia). Given the tendency for First World milonga attendees to associate in mixed gender groups at tables, beyond the front row it may be advisable to structure the seating as in a Milonga del Barrio in Buenos Aires, i.e., with oblong rectangular tables placed with the long side perpendicular to the dance floor. Thus, a First World milonga intending to promote Buenos Aires milonga traditions may have seating arrangements mimicking both a Milonga del Centro (small square tables placed closest to the floor, aligned for optimal use of the cabeceo) and a Milonga del Barrio table arrangement away from the dance floor for optimizing socializing among groups of friends attending a milonga together. A milonga organizer can have an additional impact upon the use of the cabeceo by controlling the lighting conditions at a milonga. It is not unusual for First World milongas (and some Buenos Aires milongas, particularly those for young people, such as La Viruta and La Catedral) to have low lighting conditions, which decrease the ability to see across the dance floor. Some may regard low lighting as romantic, but it reduces the effectiveness of the cabeceo. Most Buenos Aires milongas have sufficient lighting for dancers to use the cabeceo effectively for dance invitation (e.g., Lo de Celia, Nuevo Chique, Los Consagrados). In order to encourage the use of the cabeceo, organizers of First World milongas should provide sufficient lighting to allow dancers to see clearly across the dance floor to use the cabeceo effectively. A milonga organizer can also have an impact on the character of the milonga by adjusting the level of sound of the music played for dancing. The sound level needs to be high enough to provide energy for dancing, but not so loud that milonga attendees shout above the sound to talk. If the level of sound is at this appropriate level, dancers on the floor may share conversation at the start of each tango in the tanda, prior to dancing, as is done in Buenos Aires milongas [Do Milongas Exist outside Argentina? (The Milonga Codes Revisited)]. Almost all milongas in Buenos Aires charge for admission. There is no admission charge at outdoor milongas such as La Glorieta and Plaza Dorrego, whereas there is an admission charge at the putdoor milong La Calesita (Dancing Tango Outdoors in Buenos Aires). There is also free public dancing at city of Buenos Aires sponsored events such as at the Campeonato Mundial de Tango. However, these tango social dance venues are the exception. In the First World, free admission to an event advertised as a milonga often succeeds in attracting a large number of people to the event. Not all attendees are dancers who know the codes of the milonga; many are spectators and some do not know how to dance tango with a skill level necessary for navigating at a milonga. In First World cultures the ability to attract a large audience is often considered to be a beneficial characteristic of free admission milongas; this assists in the recruitment of new dancers to a tango community. However, the presence of a viewing audience, as well as presence of unskilled dancers and those who do not know the codes of the milonga, increases significantly the probability of exhibitionism on the milonga dance floor. The presence of unskilled dancers increases opportunities for teaching on the dance floor. In contrast, charging admission to a milonga decreases the presence of casual observers who provide a viewing audience for tango exhibitionists. Charging admission also decreases the attendance of casual dancers who invite opportunities for teaching, as well as increase substantially the rate of collisions on the dance floor due to their poor navigational skills. Novice dancers are also unlikely to know the milonga codes for dance invitation and thus invite others to dance by direct approach to the table rather than using the cabeceo. The presence of dancers who are unfamiliar with the cabeceo will also increase the use of the direct approach to the table by those familiar with the cabeceo when inviting to dance those unfamiliar with the cabeceo. Charging admission at a milonga reduces these violations of milonga codes. Selecting an appropriate DJ for a milonga is one of the ways in which the milonga organizer can have the greatest impact on the character of a milonga. Milonga organizers often hire DJs who are popular in the tango community. This is done to attract people, but may fail to recognize the impact of the DJ on dancing at a milonga. Witness the negative impact of the ‘alternative milonga’ [The Alternative Milonga (Neolonga): The Social Environment for Dancing to Tango Alternative Music] on tango dancing in the First World; when alternatives to classic tango music are played, connection with the music is challenging and exhibitionism may be rampant, with reckless navigation as an associated consequence. In supporting Argentine tango cultural traditions, it is important to recruit a DJ who plays the same music played in Buenos Aires milongas (Music Played at Milongas / Tango Social Dance Venues), i.e., classic tango music from the Golden Age, thereby avoiding neotango and non-tango music, nuevo tango (e.g., Piazzolla), and tango orchestras after the Golden age that play music lacking a clear rhythm. Later Pugliese (after 1950) should be used sparingly, if at all, and only if there are enough dancers who are familiar with the music and can interpret it without lapsing into exhibitionism. A well educated DJ also plays music in tandas of music that has a similar quality, i.e., usually music from the same orchestra (less commonly observed for tandas of milonga and vals). The DJ should also insert a cortina between tandas that is long enough to clear the dance floor. The music for the cortina should not have a rhythm that invites dancing. Clearing of the dance floor during the cortina not only allows for a smooth transition in changing partners, but also optimizes the sight lines for inviting someone to dance using the cabeceo at the beginning of the subsequent tanda. The DJ should not take requests for music to be played for dancing, as these requests may often be for music inappropriate for tango social dancing. Request to the DJ to play music for dancing can be prevented by having the DJ in a location that is inaccessible to dancers, or the DJ can just ignore these requests. In general, live music is inadvisable. Although live music is an attractive feature for milongas because many dancers enjoy live music, it is highly unlikely that a First World tango ensemble can produce music that has the rhythmic and emotional qualities of recorded classic tango music. In Buenos Aires today, the most experienced tango dancers attend milongas where only recorded classic tango music is played. The duration of a milonga should not be so long that there are periods of low attendance and thus low floor density. High floor density inhibits exhibitionism. It is a standard practice at First World milongas to schedule tango lessons prior to a milonga. Tango lessons increase income for milonga organizers and increase attendance at the beginning of a milonga, when floor density would otherwise be low. As a general practice, tango lessons should not be scheduled immediately prior to a milonga. Lessons before a milonga encourage practicing the content of lessons, material that has not been adequately learned, and invites teaching on the dance floor. Often the lessons scheduled before a milonga are for newcomers to tango. The rationale here is that the milonga subsequent to a beginner lesson gives newcomers to tango a taste of milonga participation and thus assists in recruitment; more likely, the presence of beginners at a milonga will modify the character of a milonga by adding dancers without navigational skills to the dance floor and may even discourage experienced dancers from attending. The presence of beginners on the milonga dance floor provides a temptation for self-appointed tango instructors to engage in instruction. The time to schedule tango instruction is before practicas, not before milongas. 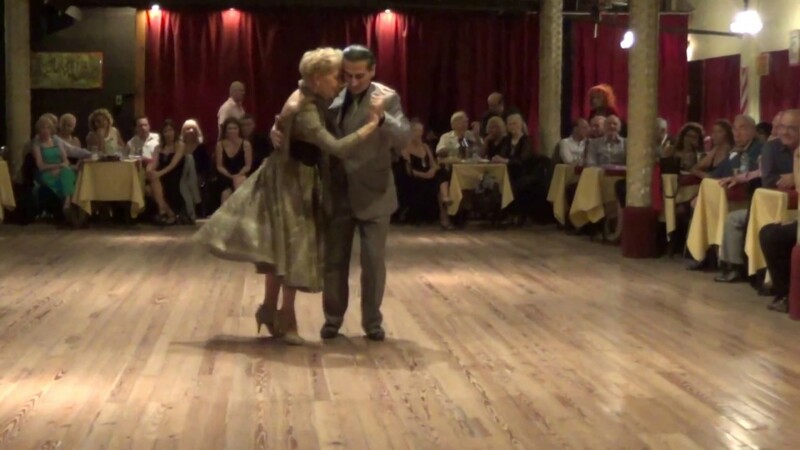 (See: Preventing Teaching on the Milonga Dance Floor: The Role of the Pre-Milonga Lesson). Tango exhibitions should not be scheduled during breaks in social dancing at a milonga. Exhibitions, by their very nature (i.e., designed to attract attention) typically demonstrate large conspicuous movements that are hazardous to other dancers on the floor if utilized at a milonga either because of their spatial expansiveness or incompatibility with the flow of the circulating ronda. Exhibitions provide opportunities for imitation of dancing that is incompatible with the character of social dancing at the milonga. If dancers lack regard for other dancers on the dance floor by reckless navigation that creates collision hazards, the milonga organizer faces a decision regarding direct intervention, i.e., asking the milonga code violators to refrain from this behavior. This may gain the milonga organizer the reputation of being the ‘tango police’, which may be deemed as detrimental to the survival of a milonga, particularly in a tango community where high value is placed upon freedom of expression in tango dancing. However, if reckless navigation is not curtailed, the milonga will gain the reputation of being tolerant to reckless navigation, and good navigators will avoid this milonga. Good navigators and their partners will appreciate the discouragement of reckless navigation. If some dancers use the milonga dance floor as a location to engage in teaching, the milonga organizer should intervene to remind the instructors that the milonga dance floor is an inappropriate location for teaching. Use of the cabeceo for dance invitation can be encouraged by placing clearly visible placards on tables stating ‘The cabeceo is welcome at this milonga’ (written in whatever languages are understood by most milonga attendees). Introducing Argentine tango cultural practices into First World milongas is a challenging undertaking. Unfamiliarity of tango dancers with these cultural practices, as well as the strong influence of local cultural practices, create resistance to implementing these goals. In order for a milonga to be successful, i.e., continue in existence with satisfied patrons, it must have sufficient attendance and the organizer must be able to meet expenses. However, in focusing on goals in milonga organization, introduction of Argentine tango cultural practices is often given a lower priority by milonga organizers than the more evident goals of maximizing attendance and/or maximizing income (or profit). Even if the economic goal of a milonga organizer is only to meet expenses, the desire to maximize attendance, within a First World culture that is not receptive to the implementation of Argentine tango cultural practices, can create conditions that counteract the promotion of these practices. First World milonga organizers often use the milonga itself as a recruiting tool by offering beginner level pre-milonga lessons, hosting a milonga in a public location, offering free admission, and playing non-tango music for dancing tango; these actions that appeal to the widest range of people who consider themselves to be tango dancers will attract many dancers who lack adequate navigational skills, approach other dancers at their table to invite them to dance, as well as create opportunities for teaching on the dance floor. Arguably, dance events with these characteristics should not be advertised as ‘milongas’. [Do Milongas Exist outside Argentina? (The Milonga Codes Revisited)]. In order to attract dancers with good tango dancing skills, those who are familiar with Argentine tango cultural practices, what needs to be offered to these dancers is an environment that provides a good selection of appropriate classic tango music for dancing, a floor density that inhibits teaching on the dance floor and exhibitionism, and seating conditions that enhance the use of the cabeceo for dance invitation. In reality, except for some ‘encuentros milongueros’ in North America and Europe, these milonga conditions rarely exist (Use of the Cabeceo and Gender Segregated Seating in Milongas in Buenos Aires and Elsewhere in the World). The tenacity of local cultural traditions regarding social dancing favor the modification of tango to local cultural values [Factors Affecting the Survival of Argentine Tango Cultural Traditions in Non-supportive First World Cultural Environments (The Dominance of Tango Extranjero)]. It is likely that when a milonga organizer attempts to create an environment that promotes Argentine tango cultural practices, the majority of attending dancers, either intentionally or out of ignorance, promulgate local cultural values by making exhibitionist movements, teaching on the dance floor, and inviting others to dance by direct approach to their tables. During the Golden Age of tango in Buenos Aires, men who were new to tango spent a considerable amount of time (reported to be a year or more) learning at practicas before they attended milongas; women practiced at home with family members (The Tango Practica, the Practica Nueva and the Tango Dance Party in Buenos Aires). They entered the milonga dance floor only after they had reached a minimum skill level for dancing at milongas, and this skill level was well above the beginner level. Even when men and women first attended milongas, they did more observing than dancing; in this way they learned the codes of the milonga. In many (if not most) First World milongas today, new dancers are given their first tango lesson and are then invited to stay and dance at the milonga. Often the instructors of the lesson remain on the dance floor and continue teaching while other dancers arrive and participate in social dancing. This sequence of events does not characterize this setting as a milonga; however, it might characterize a practica. In First World tango communities, the event advertised as a milonga becomes in part a practica, with the promotion of Argentine tango cultural practices set aside for the purpose of recruiting new dancers. In order to improve milonga conditions for experienced dancers, the practica for all levels of dancers needs to be promoted separately from the milonga, with the understanding that the milonga is for experienced dancers (Preventing Teaching on the Milonga Dance Floor: The Role of the Pre-Milonga Lesson). In addition to having an instructional function, the practica can have a social function, creating a welcoming environment for tango beginners as they acquires skills needed for the milonga. However, in order to prepare dancers for the milonga, there needs to be a set of instructors who promote Argentine tango cultural practices in their instruction, i.e., teach tango for social dancing rather than tango for exhibition, as well as teaching about tango music, the structure of music organization into tandas and cortinas at the milonga, and the use of the cabeceo for dance invitation. One of the greatest challenges to promoting Argentine tango cultural practices in the First World is the proliferation of tango instructors (including Argentines) who teach tango modified for First World cultural proclivities [Factors Affecting the Survival of Argentine Tango Cultural Traditions in Non-supportive First World Cultural Environments (The Dominance of Tango Extranjero)]. Thus, there are considerable challenges in introducing Argentine cultural practices into First World milongas. However, if a milonga organizer does not attempt to offer a milonga that promotes Argentine tango cultural practices, it will not occur. Whether this type of milonga succeeds depends upon the attitude of the local tango community, which unfortunately can be easily shaped by other milonga organizers (and tango instructors) whose primary motivation is to increase attendance and profit under the banner of ‘Argentine tango’ while casting aside the cultural practices that are inherent in the tango dance that emanates from Argentina. A milonga organizer plays an important role in promoting Argentine tango cultural traditions by shaping the characteristics of a milonga environment. Selecting a DJ who plays only classic tango music from the Golden Age for tango dancing. Creating separate sections of tables for men and for women closest to the dance floor (an ideal location) that are clearly identified as reserved for dancers who use the cabeceo for dance invitation. Providing sufficient lighting to see prospective partners to invite to dance using the cabeceo. Selecting a dance floor in which the men’s and women’s cabeceo sections are not too distant from one another. Placing chairs around tables so that they all face the dance floor and thus all dancers have a direct line of sight of potential partners with whom to dance. Using cortinas (of sufficient length) to clear the floor between tandas so that dancers will have a clear line of sight for dance invitation at the beginning of the subsequent tanda. Having an admission charge. This will decrease attendance by casual dancers who are unfamiliar with milonga customs and use direct approach to the table as the method of dance invitation. Selecting a location that is not a business establishment whose existence is reliant upon sales of alcohol. Consumption of large amounts of alcohol has a negative impact upon balance, thus creating navigational hazards. Selecting a location that has a rectangular dance floor, i.e., with perpendicular edges that clearly define the route for turning corners. Selecting or creating a size of the dance floor that is large enough to minimize collisions but small enough to limit the amount of space available for large reckless movements. Proper selection and placement of tables and chairs. Rectangular tables more clearly identify the edge of the dance floor. Tables should be placed to allow passage of non-dancers behind them (i.e., allow movement within the milonga off of the dance floor). Chairs should not be placed on the side of the tables adjacent to the dance floor, because this creates poor definition of the boundaries of the dance floor, as well as creating opportunities for collision. Having an admission charge. This discourages attendance by casual dancers who are inexperienced at navigation, or who are unfamiliar with milonga codes regarding navigation. Selecting a DJ who plays only classic tango music for dancing. Classic tango music has a clear constant rhythm and a moderate tempo that encourages orderly walking in a circulating ronda. Not scheduling pre-milonga lessons, especially those designed for beginners, as this encourages teaching on the dance floor, which interrupts the smooth flow of the ronda. The presence of beginners, who are inexperienced at navigation, also interrupts the flow of the ronda. Not scheduling exhibitions during breaks in social dancing. Exhibitions are usually not designed to follow the circulating ronda, and they may encourage similar behavior in dancers during the social dancing period. Speaking directly to dancers who create navigational hazards, informing them of the impact of their dancing, and ejecting dancers who persist in making hazardous movements. Selecting a location that is not a business establishment whose existence is reliant upon sales of alcohol. Consumption of large amounts of alcohol increases the probability of exhibitionism due to intoxication. Reducing the floor density of dancers. Open spaces on the dance floor encourage large movements characteristic of exhibitionism. Having an admission charge. This discourages attendance by casual dancers who have the erroneous assumption that exhibitionism is a core feature of tango social dancing. Selecting a DJ who plays only classic tango music for dancing. Classic tango music has a clear constant rhythm and moderate tempo that is not as conducive to exhibitionism as music (of any genre) that has an unclear or irregular rhythm or a fast tempo that encourages exaggerated or dramatic movements that are uncharacteristic of social tango dancing. Not scheduling exhibitions during breaks in social dancing. Exhibitions encourage imitation and thus increase the probability of exhibitionism on the social dance floor. Speaking directly to dancers who make exhibitionist movements, informing them that their dance style is inappropriate for the milonga, and ejecting dancers who persist in making exhibitionist movements. Increasing floor density by selecting a milonga location with a small dance floor. Tables can also be moved to decrease the size of the dance floor. Decreasing attendance by tango novices at the milonga. This can be accomplished by avoiding hosting milongas in public venues where there are novices present, by charging admission to discourage casual attendees, and by not scheduling beginner level tango lessons prior to a milonga. Not scheduling tango lessons of any level prior to a milonga. Tango lessons provide material for class participants to teach on the dance floor during the milonga. You are currently browsing the archives for the club del barrio category.